"Every day, America's public safety officers place themselves in harm's way to protect the rest of us. 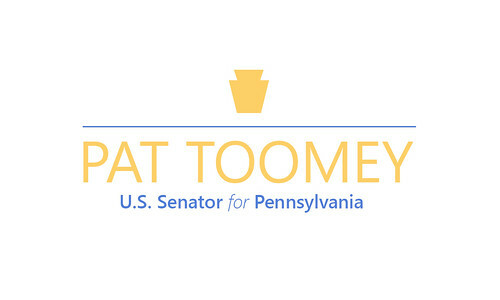 For this, they deserve our gratitude," said Senator Toomey. "Instead, our law enforcement officers have been unfairly maligned and, too often, attacked simply for the uniform they wear-for their decision to protect and serve. My legislation stands for two simple propositions: First, America's law enforcement officers should be at least as well armed as the criminals and terrorists who attack them. Second, if someone takes the life of a public safety officer, that person should expect to pay a very high price. With National Police Week, which is dedicated to remembering our fallen officers, only days away, I believe it is time to send this message loud and clear." Our law enforcement officers should be at least as well armed as the criminals and terrorist who attack them. Unfortunately, in May 2015, President Obama issued a directive that undermines this goal. President Obama's directive restricted local police from obtaining certain lifesaving federal gear, and in 2016, the Administration began seizing equipment from local police departments. Disturbingly, many of the restricted items are purely defensive, such as "riot helmets" and "riot shields"-items vital to protecting law enforcement during riots, where protesters have been known to torch cars and hurl bricks, cement blocks, and glass bottles at police. The directive also restricts armored vehicles, which were vital to rescuing hostages from an Orlando night club during the terror attack of June 2016. The Obama Administration acknowledged that depriving local police of this gear "can have life-threatening consequences, both for the law enforcement personnel and the public," but concluded it was more important to preserve "community trust." 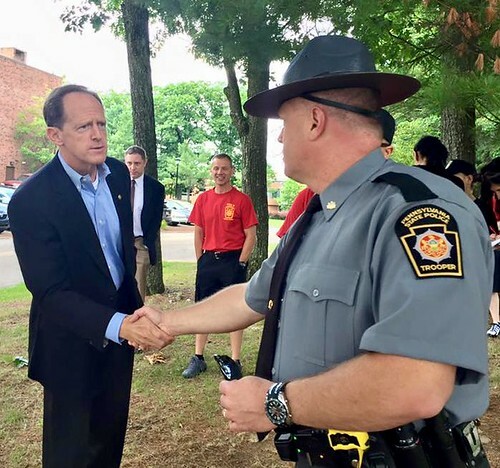 Sen. Toomey's Lifesaving Gear for Police Act reverses President Obama's dangerous restrictions, and requires the executive branch to return gear that has been seized from local police departments. Correctional officers are often targets of criminals when off-duty. Ex-convicts, fellow gang members of prisoners, and prisoners' families and friends will target federal correctional officers. The Justice Department, however, has implemented policy that essentially makes it impossible for federal correctional officers to protect themselves to and from work. Specifically, federal correctional officers may not store their personal firearms at work, and thus effectively cannot carry them while traveling to and from their duty stations. Lt. Osvaldo Albarati, a federal correctional officer in Puerto Rico, paid the ultimate price for this misguided policy. In February 2013, after completing his shift, 39 year-old Lt. Albarati was shot dead while driving on the expressway. Three inmates hired the shooter to murder Lt. Albarati. Due to Bureau of Prisons policy, Lt. Albarati was unarmed and unable to defend himself. The Lieutenant Osvaldo Albarati Correctional Officer Self-Protection Act requires the Bureau of Prisons to provide a safe means for federal correctional officers to store their personal firearms while at work-either in a central storage area located at the prison or in a Bureau of Prison approved vehicle lockbox. This bipartisan bill will directly benefit the officers who serve at Pennsylvania's seven federally operated prison facilities. Anyone who murders or targets a public safety officer should be prepared to pay the ultimate price. When a jury in a federal case considers whether to impose the death penalty, the jury must consider certain "aggravating" factors. Current law states that if the murder victim is a federal law enforcement officer or federal prosecutor, this fact shall weigh as an aggravating factor in favor of the death penalty. The Thin Blue Line Act provides the same level of justice to local law enforcement officers, prosecutors, and first responders. It also enhances the penalty when a defendant targets a law enforcement officer, prosecutor, or first responder solely because that individual has chosen to protect and serve.